Although a dedicated smoker is a nice thing to have, it is not really necessary. Although less convenient, you can use just about any charcoal grill as a smoker, as long as you can effectively regulate the air flow with some simple modifications. This can turn your backyard grill in multi-tool meat machine! Weber kettles are really good at regulating air flow so they work well for this type of modification. You can easily convert your Weber into a smoker with a Smokenator & Hovergrill. 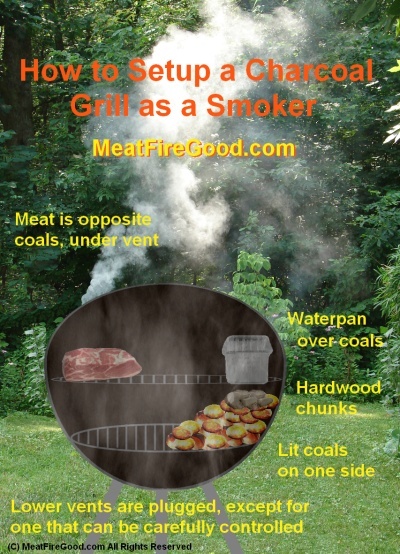 However, I am writing this post to help you setup your charcoal grill as a smoker without much in the way of extra expense. Knowledge is power, baby! Water pan This keeps the cooking environment humid and your meat moist despite the long cooks necessary for smoking. I use aluminum loaf pans because they hold a good amount of water without taking up cooking grate surface area. Plus they can be recycled. Hardwood chunks This is where most of your flavor comes from (in addition to your charcoal). You can use smaller bits and pieces, but chunks are more manageable. Just about any fruit wood is good, as well as oak, hickory, pecan, mesquite. Use cured wood that is not more than a year old for the best flavor. By the way, don‘t soak your wood ahead of time, at least as long as you are using the water pan — and you should. I know, I know… a lot of people use soaked wood, but discussion about this will have to wait for a future post. Air Control The ability to choke the incoming airflow down to one vent that can be well regulated is essential. This can be as simple as packing extra air holes with wads of aluminum foil. Hey, I didn’t say it would be pretty but it is effective. Without this, your fire will get too much oxygen and will roar above the temps needed to smoke your meat. After all, your grill was designed to be a grill, not a smoker. Accurate Temperature Reading You can almost certainly ignore the bi-metal thermometer installed in the lid of your grill. There are a number of reasons why it is inaccurate, but suffice it to say for our present purpose, you really need an accurate temp reading at the level of the cooking grate. The best way to do this is with an accurate digital thermometer . At least go to the trouble of using a calibrated oven thermometer that is placed on the cooking grate beside your meat (typically $5- $7). As for checking the accuracy of your thermometer, you can use the boiling water method — water boils at sea level at 212ºF. As it turns out, smoking meat in the 210º-225ºF range is ideal so calibration with boiling water gets you in the right range. Plan Ahead Figure out how to arrange all everything mentioned here and (especially your airflow) on a day before you plan your cook, calibrate your thermometer, and test your new method before you drop that cash on baby backs. It is worth the effort. Also, allow yourself an hour to get your coals lit and temp stabilized before you put on the meat the day of the cook. OK, so how does one go about smoking? Here are the basics. Once the cooker is warmed and temperature stabilized at about 210º-225ºF, place your seasoned meat on your cooking grate (try my Sweet Chili Wonder Rub as a dry rub for great flavor that is not hot), then set a couple of chunks of dry hardwood on the coals. Add a small handful of hardwood to the coals every 1/2 hour for 1 1/2 to 2 hours. I strongly suggest you do not add hardwood beyond the 2-hour mark, else you risk your meat tasting like an ashtray. Maintain lit coals, temperature, and water in your pan until your meat reaches the minimum safe temperature AND it is done. Done? The latter comment about being “done” has a somewhat complicated, lengthy explanation that I will avoid here. Take these steps to prepare your new smoker setup and look for a forthcoming post that explains how to go about your first smoking session in the very near future. This entry was posted in How-To Guides, Smoking & BBQ 101, Uncategorized and tagged backyard, Bar-B-Que, Barbecue, Barbeque, BBQ, beginner, charcoal, charcoal grill, cooking, cookout, DIY, food, grill, guide, how-to, kettle, meat, outdoor, setup, smoke, smoker, Smoking & Barbecue 101, summer, summertime, Weber, weber kettles. Bookmark the permalink.